Employing the third-generation technology of "catalytic alkylation of benzene with ethylene from fluidized catalytic cracking (FCC) dry gas for producing ethylbenzene," which was a brainchild of researchers from the CAS Dalain Institute of Chemical Physics, a new production unit of 80,000t/a was commissioned successfully in a petroleum refining plant in northern China recently. The production unit was designed by the Fushun Branch Co. of the Engineering Designing Co. Ltd. of China National Petroleum Corporation (CNPC). 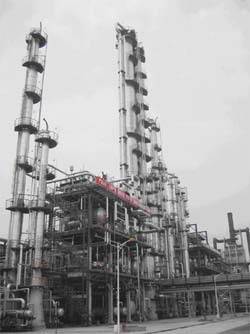 High quality EB product was obtained on the next day of the commissioning, and both the ethylene conversion and EB selectivity were greater than 99%. 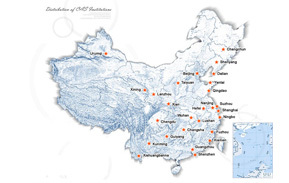 It was anticipated that other two commercial units of the same type will be commissioned this year, one will be a 80,000t/a unit at the Jinzhou Branch Co. of SINOPEC, and the other a 100,000t/a unit at the Linyuan Petroleum Refining Co. in northern China.